The tragedy at Sandy Hook Elementary School may mentally affect many children, especially those that may have recently been through a traumatic event. "It's such an ... unspeakable event that any young people when they learn about this will be shocked," Dr. Victor Fornari, director of the division of child/adolescent psychiatry at North Shore-LIJ Health System in New Hyde Park, NY, told CBSNews.com. On Dec. 14, 2012, a gunman shot and killed 26 people, including at least 20 children at Sandy Hook Elementary School in Newtown, Conn., about 60 miles northeast of New York City. An official told CBS News the gunman targeted his mother's classroom. The gunman was later found deceased in the school. Obama: "We have been through this too many times"
The American Academy of Pediatrics (AAP) said in a statement that it "strongly recommends" that parents and schools use available resources to talk to children about the tragedy. They offer resources on their website and also suggested that parents can talk to the child's pediatrician for advice and support. For the children who were at the school at the time, the degree to which they are affected could vary depending if they lost a loved one or a friend and what they witnessed, said Fornari. But there is no denying that everyone will be affected, including many in the neighboring communities. CBS News medical correspondent Dr. Jon LaPook says the most important thing for parents to do first when talking to children involved in the tragedy is to listen to their concerns. Answer their questions, he says, instead of telling them what you think they should hear. He also recommended Child Mind Institute as a good tool for parents to use. "Then try to translate it into terms they understand," LaPook told CBS News' Norah O'Donnell. "But I would not give them gory details that they don't need to know right now." 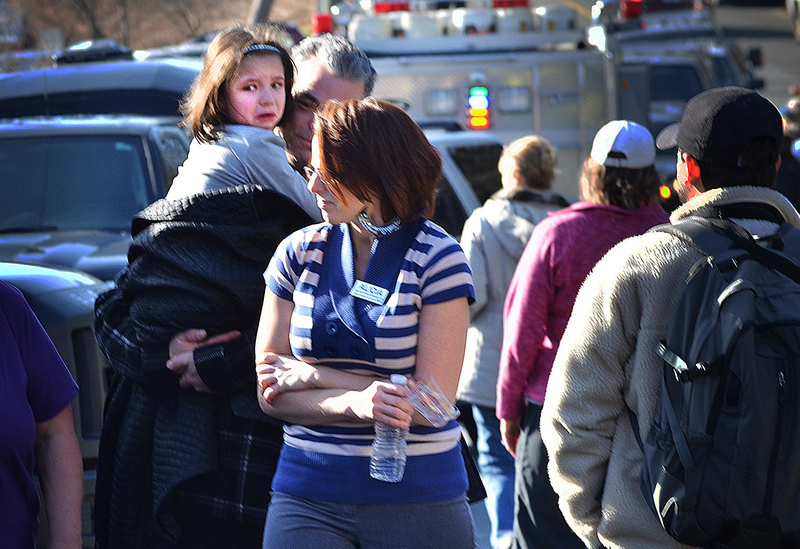 Even children who were not at Sandy Hook but may have heard of the shooting could be traumatized. Fornari says that about 10 percent of children have anxiety, and they can be expected to have a "heightened reaction" to the shooting. Especially vulnerable to mental distress are children who have recently gone through a traumatic experience, including those who lived through superstorm Sandy, those who lost a loved one recently or those who had a family member get sick. Signs that a child is being mentally affected by the tragedy include if they are withdrawing or getting clingy; some may become more disobedient or guilty, Fornari explains. He says children may be shocked and not believe what happened. Some may want to spend more time with their parents. Others might say they don't feel like studying or doing homework because they are having a hard time focusing. "The range of reactions could be enormous," he says. LaPook adds that children are still at a stage where they're trying to make sense of the world, so he would explain to kids that while bad things happen, "the world is still safe for them." Fornari says it could be good to minimize children's exposure to the media and for adults to minimize their conversations around young people, a sentiment that the AAP echoed. However, it is understandable that many schools will be directly addressing the shooting with their students and discussing their own safety plants. Fornari says that parents should be there to listen to their children to understand what they've learned and be able to clarify in simple terms that are age appropriate. It's important that a parent not pass on their own fears to their children. "If a parent is overstressed and traumatized themselves, they are not in a position to be reassuring and supportive," he says. Parents can also help soothe kids by keeping routines the same even though they themselves are understandably anxious. "Our understanding that schools are safe havens were children are educated is shattered, and it's very disconcerting," Fornari explained.